An inaugural address of striking liberal ambition and partisanship. President Obama's second inaugural address won't be remembered for stirring lines, but then its purpose seemed to be more political than inspirational. Mr. Obama was laying down a marker that he has no intention of letting debt or deficits or lagging economic growth slow his plans for activist, expansive government. Inaugurals usually include calls for national unity and appeals to our founding principles, which is part of their charm. With the election long over, swearing in a President is a moment for celebrating larger national purposes. But Mr. Obama's speech was notable for invoking the founding principles less to unify than to justify what he called "collective action." The President borrowed the Constitution's opening words of "we the people" numerous times, but his main theme was that the people are fundamentally defined through government action, and his government is here to help you. On that theme, the speech was especially striking for including a specific defense of the federal entitlement programs that everyone knows must be reformed. Mr. Obama cited "Medicare, and Medicaid, and Social Security" by name as "the commitments we make to each other." Typically, such programmatic specificity is reserved for State of the Union speeches. Mr. Obama almost seemed to be elevating them to Constitutional rights. 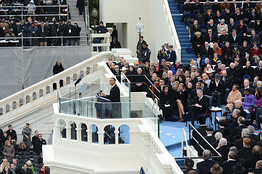 Typically, too, inaugural addresses avoid overt partisanship. But after mentioning those entitlements by name, Mr. Obama couldn't resist saying that those programs "do not make us a nation of takers; they free us to take the risks that make this country great." The "takers" line was a clear shot at Mitt Romney's most famous campaign gaffe. This should have been beneath a Presidential inaugural, but then again it fits Mr. Obama's post- re-election pattern of continuing to demean and stigmatize those who disagree with him as if the election campaign is still on. If you think this characterization is unfair, White House communications director Dan Pfeiffer expressed the current mood in the West Wing this way to the Washington Post on Inauguration Day: "There's a moment of opportunity now that's important. . . . What's frustrating is that we don't have a political system or an opposition party worthy of the opportunity." So neither the checks and balances of U.S. democracy nor the Republican Party that controls one branch of Congress is worthy of President Obama's grand aspirations. Presumably they must bow to his superior moral purposes. It's important to appreciate how much such contemptuous talk deviates from normal public White House respect for the men and women a President must do political business with. All of this suggests a second-term President less interested in bipartisan accommodation than in aggressively pursuing the progressive goals on behalf of what he views as a new center-left majority. One of his most passionate moments was even devoted to addressing "climate change," of all things. He rarely mentioned the subject in the election campaign. But doing something about global warming is a commandment in the modern liberal catechism, and now Mr. Obama says it will be a major priority in the next four years. He even used the stock liberal description that those who disagree with him on climate change "deny" scientific fact. It's another example of deliberately stigmatizing his opposition. We were also struck by what Mr. Obama didn't say considering the day and its symbolism. He spoke on Martin Luther King Day, a national holiday, yet apart from a fleeting reference he barely mentioned the occasion. This is odd because there could be no greater symbolism that King's dream has been realized than the second inauguration of our first black President on the opposite end of the Washington mall on which he gave his most famous speech. It was a missed opportunity to bind up old wounds, but perhaps an intentional one lest Mr. Obama understate the need for even more urgent government action. Americans want their Presidents to succeed, because they naturally assume that when Presidents do well so will the country. Mr. Obama will thus get a respectful hearing for his agenda, even if he has never been as candid as he was Monday in asserting his liberal ambitions. But if his second term does break down into more partisan gridlock and rancor, let the record show that the President set the tone with his second inaugural.